Yesterday, a report from Japan's Nikkei newspaper asserted that Nintendo would be putting trailers, promotional info and mini-games about upcoming releases on smartphones. Now, a statement from Nintendo says that they won't exactly be doing that. "Nikkei's article contains information previously stated by Mr Iwata during past press conferences, including statements which relate to Nintendo's willingness to make use of smart devices to promote our products. 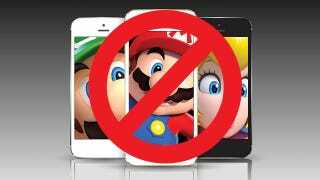 However during such past announcements Mr Iwata has also stated that Nintendo's intention is not to make Nintendo software available on smart devices and as such, we can confirm that there are no plans to offer minigames on smartphone devices. " The alleged move seemed like the company was bending towards a more robust engagement with the same portable hardware that observers say is a threat to Nintendo's bottom line. Of course, Nintendo has denied rumors before, only to have them be borne out by actual news, as in the case of the 3DS XL. We'll need to wait and see if and how Nintendo ever puts its content on devices outside its ecosystem.